The raw facts are that Kent finished seventh in Division Two of the Championship and did not challenge in limited-overs cricket. It would be easy, in these circumstances, for my last blog of the season to lambast the club's management and demand wholesale change. But - fun as that would be - I intend to resist. In fact, I feel happier as a Kent supporter than I used to. Canterbury feels more welcoming these days - in the past, one felt the 'establishment' saw spectators as an unwelcome side effect of running a cricket club. In the dark days (the 1990s), you were either a member (primarily there for the Pavilion bar and the lending library) or an intruder, who must not expect either audible tannoy announcements or shelter from the rain. It is interesting that Cricinfo chose to call these blogs a "supporters' network" - it feels as if Kent have only very recently acknowledged the concept of supporting the team. I was recently encouraged to complete a detailed survey. I don't remember ever being asked my opinion before. Crucially, this included - traditionalist heresy! - non-members. At last, the club may finally 'get it'. Developments have included the adoption of themed promotional offers for Friday night Twenty20 games, a picnic area behind the replanted lime tree and online video highlights packages. Small changes, yes, but they suggest a desire to please everyone - not just those committed to an expensive membership, cloistered from direct sunlight in the Pavilion. By far my favourite innovation was a competition held during the interval at YB40 matches. Willing spectators were ushered together on to the outfield, before a sky high catch was belted towards them. Whoever emerged from the inevitable scrum with ball in hand won a prize, usually vouchers for the club shop. It was simple, harmless fun. This is only the second time I can remember actually enjoying Kent's attempts at 'entertainment'. Only a visit from the local Gurkha regiment's marching band sticks in the memory. Their routine went on so long that the field was set for the second innings before it appeared to be reaching any conclusion. At this point, the Gurkhas began their second lap. Playing regulations were swiftly abandoned. Well, would you tell a troupe of trained killers to stop? As well as not disrupting the start of the second innings, the catching competition was unpretentious and let anyone who wanted to take part - never distracting from the real entertainment, the ongoing cricket match. Budgets were probably the real reason for this more humble half-time fare, but I would prefer to think that Kent's marketeers have cottoned on to the fact that cricket supporters have just one shared interest - cricket - and the focus should be on that. It should help their cause that Kent's season ended spectacularly, with Darren Stevens plundering an unbeaten 205 at almost a run-a-ball to record the second-largest successful run chase in Kent's history. Even against an already promoted Lancashire team shorn of their front-line bowlers, it was a remarkable achievement. Stevens may be 37, but his touch and timing put most 27-year-olds to shame. Among Englishmen, surely only Kevin Pietersen rivals his ability to destroy a bowling attack. It was rather touching that the victory was sealed with Stevens' old mucker Rob Key at the crease. His thumb had been broken the evening before, fielding in gully, but Key came out at No. 10 to score three runs off eleven balls. (Although, as Stevens ended three runs from his highest first class score, he may have preferred Key to dead-bat it). 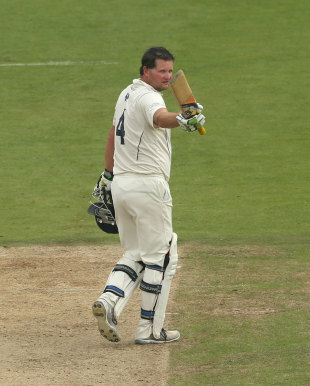 Key had been the hero of the first innings, scoring his 51st first-class hundred. He rode his luck, with two chances dropped and several other strokes narrowly evading the slip corden. But, it was a brutal innings, scored at such a rate that made Kent's later run chase feasible. The form of these two all-time great Kent batsman means I leave 2013 with as many good memories as bad, in spite of tour position in the Division Two table.